The classic solitaire card game is now available in a very special version for the most fans of the anime series Dragon Ball Z. You will have a deck of cards with the protagonists of this legendary manga series and you must start playing solitaire to win. The way to play is the same as always, you will have to place the different clubs of the deck in the four blank spaces on the top, sorted from lowest to highest, from one to the king. For this you will have to go making stairs alternating colors in the rows below and discovering all the cards that are face down. Do not wait any longer to enjoy the saiyan version of the lonely classic. 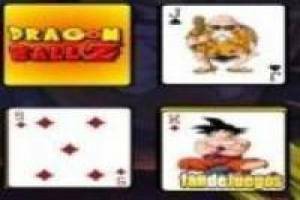 Enjoy the game Dragon ball z: Solitaire, it's free, it's one of our Spider Solitaire games we've selected.